HP LoadRunner is an application load testing solution that lets users identify and prevent application performance problems by spotting and immediately addressing bottlenecks prior to the implementation or deployment of a new system or upgrade. The testing software LoadRunner allows users to test robust Internet applications, Web 2.0 technologies, ERP and CRM applications, and legacy applications. 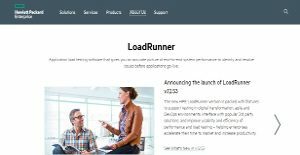 With Loadrunner, users have this full image of their system’s end-to-end system performance, enabling them to view the whole application, identify the issues prior to going live to ensure that the new applications or upgrades have met performance requirements. HP Loadrunner also brings down expenses related to hardware and software by precisely forecasting application scalability and capacity. HP Loadrunner provides users with a full and very accurate image of their system’s end to end performance, allowing them to immediately identify and fix bottlenecks and other issues prior to the applications going live. The system is capable of emulating hundreds or thousands of concurrent users to place the application in environments that simulate the rigors of real-life user loads. As the process goes, the system gathers information from key infrastructure components (Web servers, database servers etc). The results can then be subjected for detailed analysis to discover the reasons and triggers for particular behaviors. Loadrunner is designed to support a vast selection of applications. This means developers can test a variety of applications such as mobile, Ajax, Flex, HTML 5, .NET, Java, GWT, Silverlight, SOAP, Citrix, ERP, and legacy to name a few. Testing mobile applications is a breeze. With Loadrunner, users can gauge all aspects of mobile application. This means the software is an ideal choice for testing total mobile performance, from device level, network, and backend. Developers can also use Loadrunner to test cloud-based applications. The software is capable of running fast, flexible, and realistic load testing, even from various geographic locations. This is done by scaling the website load testing up and down, replicating the requirements of business applications. If you are considering HP Loadrunner it might also be sensible to investigate other subcategories of Best Test Management Software gathered in our base of SaaS software reviews. There are trendy and widely used systems in each software category. But are they essentially the best fit for your company’s special wants? A popular software solution may have thousands of subscribers, but does it provide what you require? For this reason, do not blindly spend on popular systems. Read at least a few HP Loadrunner reviews and consider the elements that you want in the software such as the cost, main features, available integrations etc. Then, choose a few apps that fit your wants. Check out the free trials of these products, read online comments, get information from the seller, and do your research meticulously. This exhaustive groundwork is sure to aid you select the most excellent software solution for your organization’s unique wants. How Much Does HP Loadrunner Cost? Expand your testing capabilities by adding more virtual users. We realize that when you make a decision to buy Test Management Software it’s important not only to see how experts evaluate it in their reviews, but also to find out if the real people and companies that buy it are actually satisfied with the product. That’s why we’ve created our behavior-based Customer Satisfaction Algorithm™ that gathers customer reviews, comments and HP Loadrunner reviews across a wide range of social media sites. The data is then presented in an easy to digest form showing how many people had positive and negative experience with HP Loadrunner. With that information at hand you should be equipped to make an informed buying decision that you won’t regret. What are HP Loadrunner pricing details? What integrations are available for HP Loadrunner? Pros: There are many things that I like about LoadRunner starting from its simplicity, to integration with reporting, graphs and the fact that this tool is time-saving. We are able to cover more during the testing phase so we can provide thorough reporting to management department. Because this product does all the work, we have lot of time to focus on other areas and to work on succeeding our goals. We also collaborate with our developers in order to provide more testing coverage of the code. The product is easy to learn and it can be learn even by those who are not tech-savvy. With Test case management we are able to follow the same set-up and to be more organized. Cons: What I don’t like is the price and the amount of time that it takes to fix some issues, when the software shows errors so we have to call their support team. We had to wait few days in order to resolve the issue only to realize that we had to restart the server or even refresh the cache on the server. Pros: Demand is proportional to quality of the product and that’s why I believe that LoadRunner is on the top of the line all these years. The tool itself is user-friendly, highly customizable and versatile. Cons: I have used many other tools in my career, and I cannot say that I have something to dislike about this product. All I have to say that it’s bit pricy, and I think that they need to improve the managing of the C code because it needs more expertise. If you need more information about HP Loadrunner or you simply have a question let us know what you need and we’ll forward your request directly to the vendor.